Each year, St. George's hosts an exhibit and fine art sale featuring local and regional artists. Hundreds of pieces of artwork are on display and are available for purchase. Artists have the opportunity to introduce their work to a large number of serious collectors of fine art, as well as those who are just beginning to learn about important regional artists. Thirty percent of the proceeds goes to the St. George's Arts Alliance to enhance the arts programs of all three campuses. The event is free and open to the community. The Arts Alliance supports arts programs at all three St. George's campuses. Support includes the purchase of portable sound systems, musical instruments, a 25-piece rhythm band instrument set, art supplies (watercolors, tracing pads, sketchbooks, clay, etc. ), drum-line, mat cutters, and matting supplies to showcase student artwork, and have provided for visiting artists on our campuses. 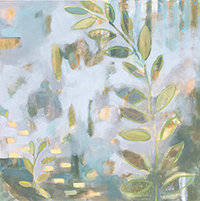 Bess Farris is a local Memphis artist working primarily with acrylics on canvas. She has a deep passion for design, color, and texture, which can be seen in her works. She is inspired by nature, music, and the playful, adventurous spirit of her two young sons. She desires to approach art in a child-like manner: full of wonder and whimsy, and without fear. For Bess, art is as much about the process as it is the product. She layers paints, mediums, and washing using both palette knives and brushes until the story of the piece is told. If you have questions, please contact Maggie Murff at 901.261.2389.